There's an old saying.. "Most things appear very dull just before they become magnificent." As a kid, I couldn't comprehend how anyone could demolish anything this beautiful. To this day, the explanations still feel as empty as they did then. Like "It's so outdated!" "It's falling apart!" "Maintenance costs!" etc. etc. So many towns, churches and universities have found ways to preserve the history that exists within the walls of such wonderful structures. What the heck was our excuse? I remember the small crowd of people that came to watch the demolition. Most of us stood in the north parking lot with our jaws completely dropped. There's a certain amazement that comes with any large-scale demolition. 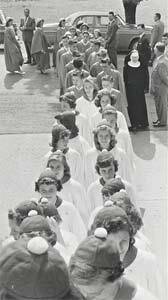 But there were also strong and mixed emotions that had not yet been put into words. I remember the huge yellow crane that was brought in to get the job done. It's large "tank like" tracks would squeak as it positioned itself for it's next barrage. The engine of the crane would belch out its exhaust and, as the onlookers braced themselves, the wrecking ball would strike the wall. The bricks, glass, wood and memories splashed apart and came tumbling down into large gray piles of rubble. After each hit, clouds of dust would rise and then sadly hang over the debris. Hanging like clouds of lingering souls making one last inventory of there long time home... before having to move on. This was obscene! No one there could believe it. 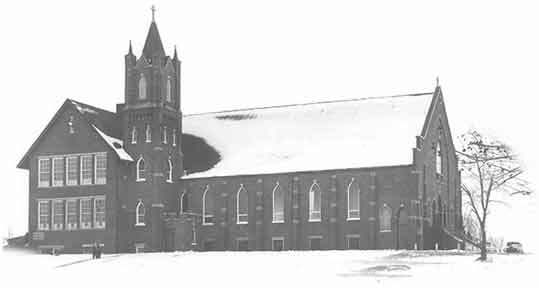 As the day wore on, the churning of the crane's engine continued and the walls of the church slowly crumbled to the ground. What happened next, none of us will forget. It almost became symbolic. Like a last gesture to finally remind us of her beautiful existence.. And the chapter that was now about to be ended. The crane moved to get a better shot with the wrecking ball. Everyone in the parking lot moved to the end of the lot closest to the church. We all held our breath as the ball swung back and took aim. Everyone had been secretly waiting to see this final strike. Once the tower was gone... It would be finished. Still in disbelief, no one could imagine watching that wrecking ball hit that beautiful bell tower. Like slapping the face of anyone that had ever held this place dear, the ball arrogantly smashed into the tower. 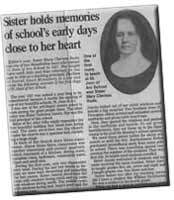 You could almost hear the voices of the many children that had attended within her walls screaming "WHY?" The ball hit the tower with a harsh ferocity. But what happened next... no one expected. After the ball hit, a large portion of the tower's wall dislodged and came tumbling to the ground before us. As it hit the ground, it burst into hundreds of bricks and large pieces of debris. The pieces then started rolling and bouncing down the gassy hill towards the parking lot... and we were all directly in its path! I remember dropping my bike and running away with everyone else. I felt like I was in one of those Japanese movies running from Godzilla! Bricks were flying everywhere and I wasn't stopping till I hit the road! When everyone stopped running, the first thing people did was look around to see if anyone was hurt. Everyone appeared to be ok but I had lost a couple of bike spokes to one of those flying bricks! The crane turned off its engines and the workers ran down to the lot to make sure everyone was alright. Most people dusted themselves off and reassured others that they were fine. At that point, a certain silence fell over the area. Everyone, including the workers, stopped and just stared at the now destroyed bell tower.
" This was it." "It's gone." At that point, it was as if a cloud of quiet embarrassment fell over us all. And over our town. The picture on the left shows those wonderful stairs that bring back so many memories for many of you. All that is remaining today is a small cement slab that used to have the bike rack on it. It's just about ten feet left of the stairs. The picture on the right was an unbelievable find! 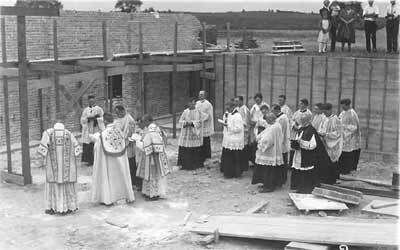 It shows the priests blessing the begining of the construction (probably in the early 1920s). What's really cool is when you look at the people standing on the upper right side of the picture, look at the view behind them. No homes and hardly any trees for that matter. 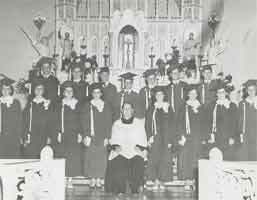 The picture on the left shows one of the graduating classes. The shot on the right is a close-up of the same shot but showing more detail of the old altar. 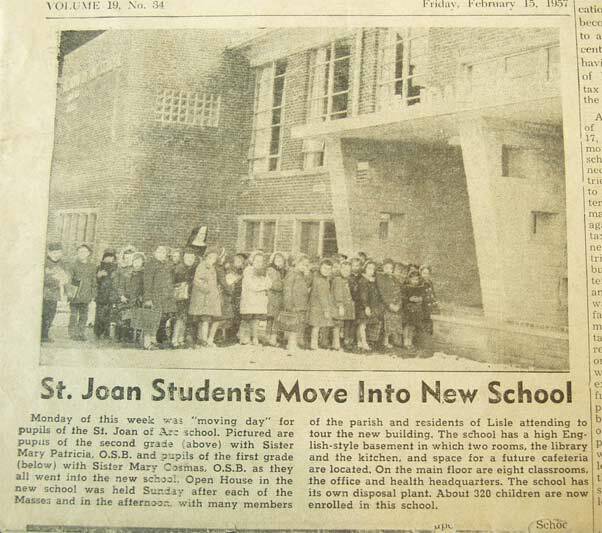 Here are two rare shots showing two of the three original class rooms at the St. Joan of Arc School. Check out the wood floors, statues and even those old radiators. And yes... Those are "chalk boards!" 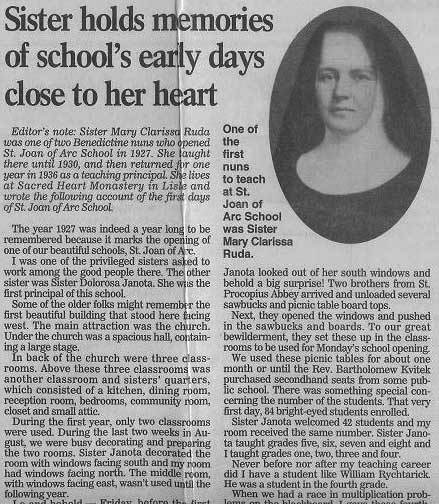 The paper on the left contains a narrative from one of the original nuns of St. Joan. It is so interesting and gives some interesting facts about it's history. Click here to read article. 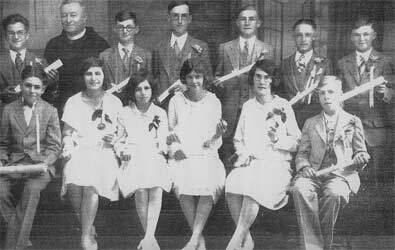 The photo on the right is of the first graduating class. Great looking bunch! Oh... Can you spot Harry Potter in the photo? These photos are pretty self explanatory. Good looking kids with funny looking hats! 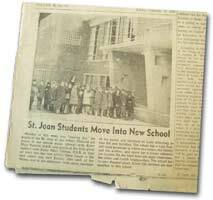 The article on the left tells the exciting story of the opening of the new St. Joan School! The paper is from 1957. 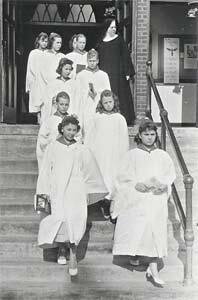 And yes, the photo on the right is the "new" school with the old church/school in the background. 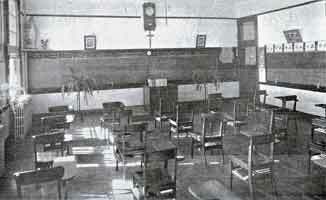 The "new" school still stands today. 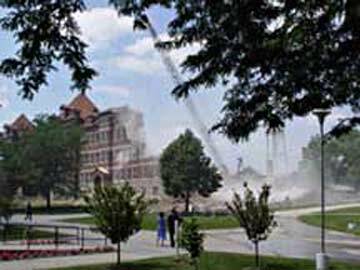 Benedictine College Tears Down Beautiful Benedictine Hall! 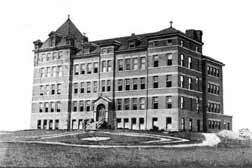 Many of us remember the awesome buildings located at St. Procopius College, now called Benedictine University. 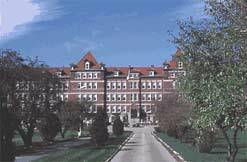 Many of you may have even attended college there and lived in the historic Benedictine Hall. They tore it down this past year. 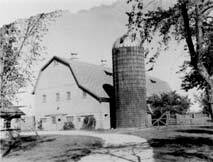 The barn on the top left was on the land where they built the college. The photo on the right shows it in all it's glory in latter years. 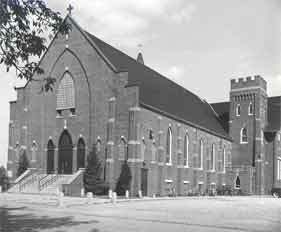 The photo below shows it being demolished. Nice huh? Who had been our home, our shelter, and our guide. Many memories she has within her walls. 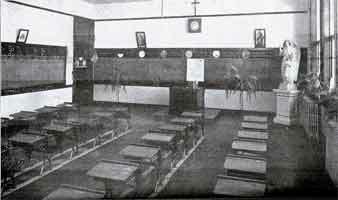 Memories, of each and everyone who entered her halls. In history, in memory, and in admiration. I will miss her copper roof, red brick, iron hand rails, and oak doors. I will miss Benedictine Hall.